In meeting with bereaved mothers and various MKs, Danon calls on Netanyahu to stop terrorist release after string of terror. 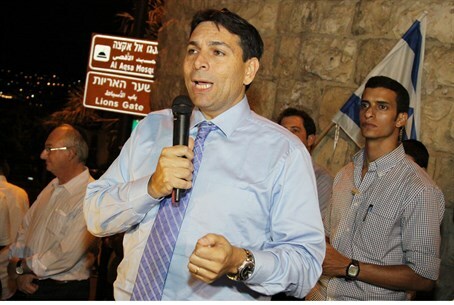 Deputy Defense Minister Danny Danon (Likud) met with bereaved mothers and a mixed group of MKs on Wednesday, expressing his opposition to the planned terrorist release early next week. "I call on the Prime Minister to reconsider the release of terrorists given the recent terror attacks," declared Danon at the meeting, referring to the recent wave of attacks since last Friday. "In a normal country in which a bus blows up on Sunday, a police officer is stabbed on Monday, and a worker fixing the security fence is shot to death on Tuesday, terrorists would not be freed the following week as a 'gesture,'" stated Danon. The meeting was attended by MKs from various parties on all ends of the political spectrum, including David Tzur (Hatnua), Nissim Ze'ev (Shas), and Jewish Home MKs Yoni Chetboun, Shuli Muallem-Refaeli and Ayelet Shaked. The bereaved mothers that spoke at the event included Tali Ben Yishai, the grandmother of the Fogel family which was massacred in 2011 in Itamar; Sherri Mandel, whose son Kobi was murdered in 2001; Chaya Rond, whose son Erez was shot to death in 2002; and Shira Avraham, whose infant daughter was murdered by a terrorist in 2001. "I arranged this meeting today first of all to show these dear families that all of us, representatives of different parties, remember their dear ones, remember the sacrifice they were forced to make in living in the land (of Israel)," noted Danon. In November, after the second batch of terrorists were released and soldier Eden Atias was stabbed to death, Danon similarly called on Netanyahu to stop releasing terrorists. At the time, Danon said the peace talks "are deluding the Israeli public and the Arabs. We must immediately stop this predictable collision course." Justice Minister Tzipi Livni (Hatnua), who is charged with managing the peace talks under whose framework terrorists are being released, said Sunday that Israel should ignore terrorist attacks and continue peace talks. A senior Palestinian Liberation Organization (PLO) official in November revealed the PA is staying in the talks only to free all 104 terrorists.